You must know by now that I really love spicy food. 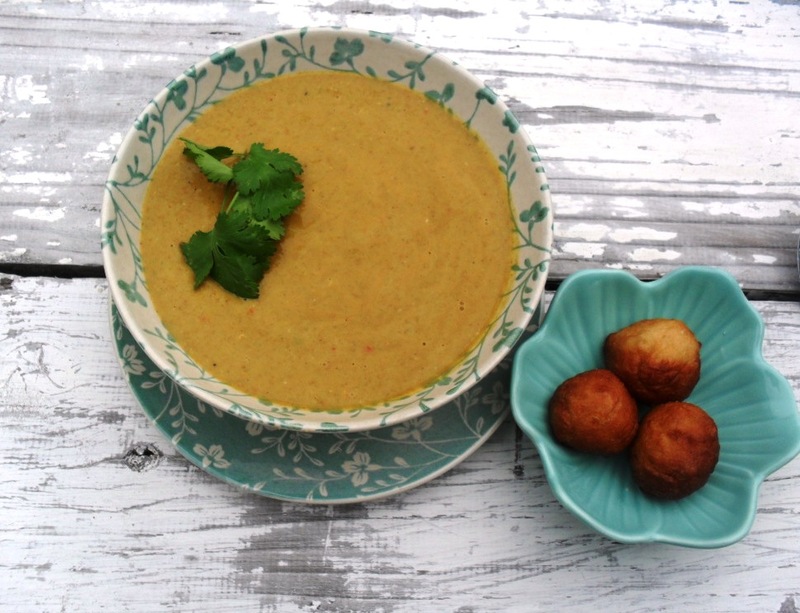 This soup is spicy and perfect to serve in winter. 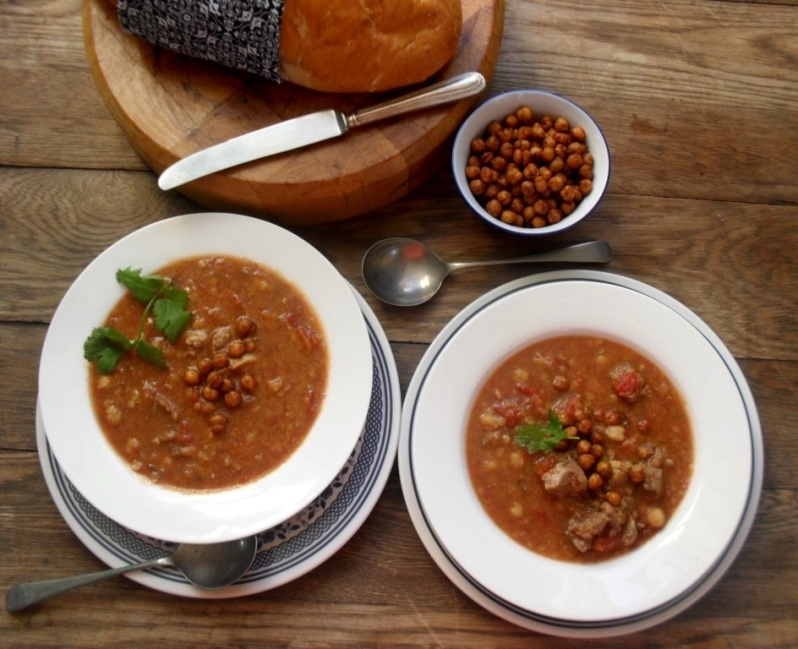 To add some crunch, I am serving the lamb and chickpea soup topped with spicy roasted chickpeas. 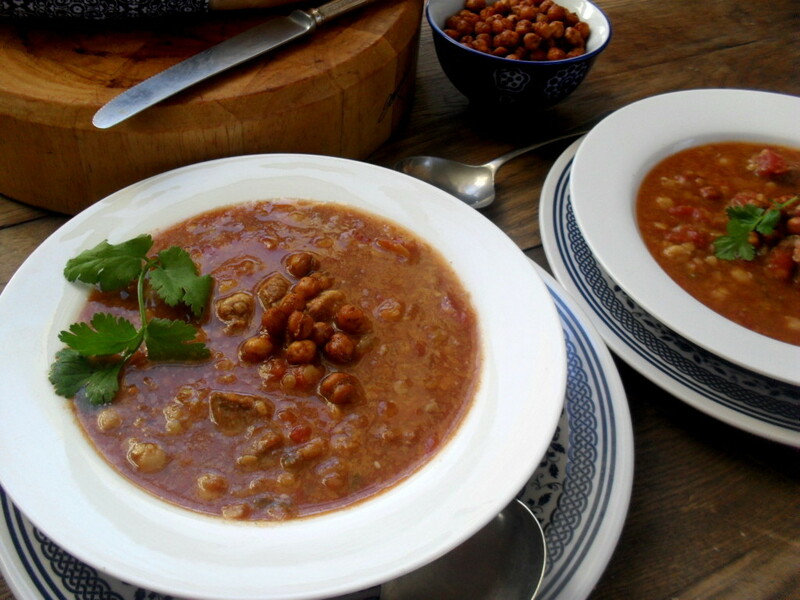 The soup reminds of a Moroccan harira soup, which is the traditional soup of Morocco. The traditional harira contains fresh tomatoes but I used tinned tomatoes. The lamb can be replaced with chicken if you prefer. The spicy roasted chickpeas can also be served as a snack. I got the idea for these delicious morsels on the Food24 website. You can change the spices in accordance to your preference or use herbs to season these roasted chickpeas. I served them separately with this soup since it must be added to the soup just before eating the soup. If the roasted chickpeas are added to early, it loses al its crunch! Although it sounds as if other parts of South Africa is already enjoying spring it is still very cold in Cape Town. 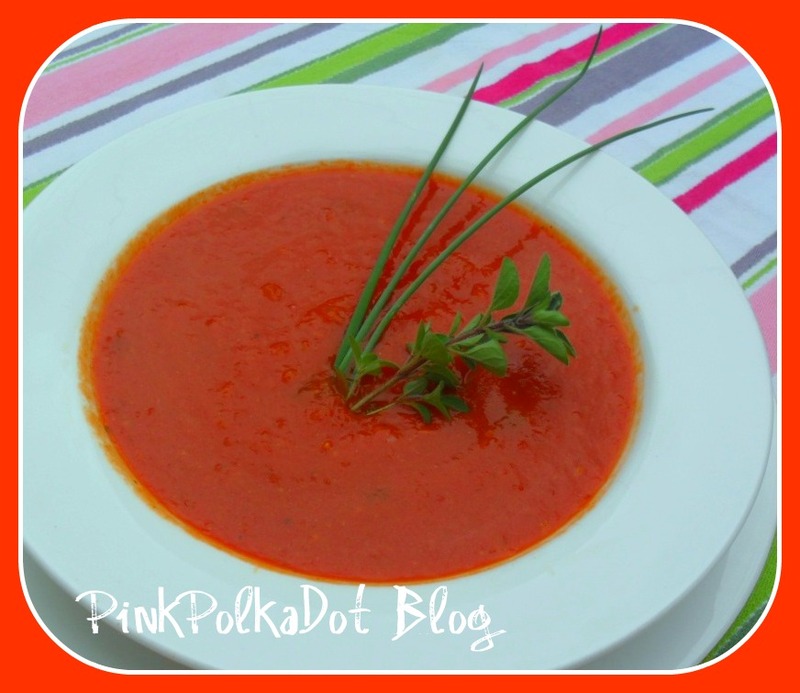 This is a delicious soup to make during the last winter days. Enjoy and remember to have fun in the kitchen! Heat oil in a large heavy-based pot; cook onion until soft. Add spices, cook for 2 minutes, stirring all the time. Add lamb and celery and cook for 3 minutes whilst stirring to coat the lamb with the spices. 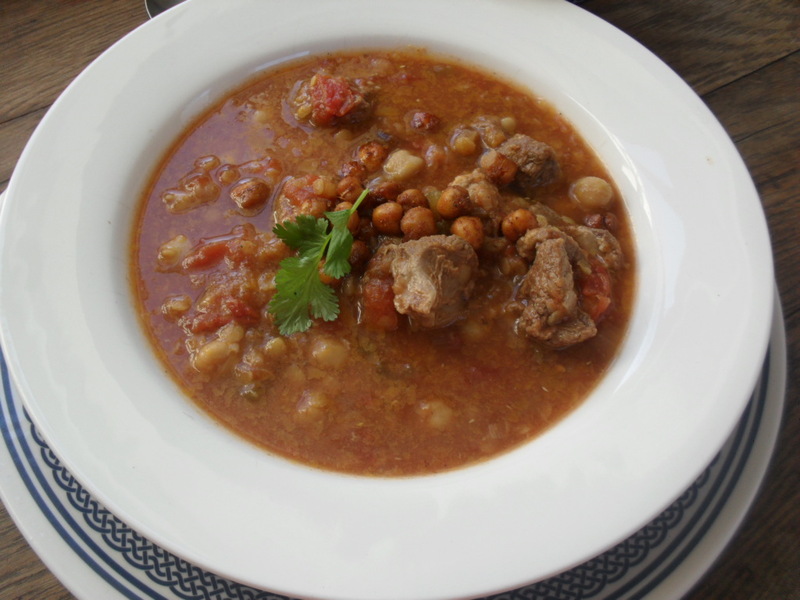 Add the tomatoes, water and chickpeas, bring to a boil, reduce the heat and simmer, covered, for 90 minutes until the lamb is tender. Stir occasionally. Add the lentils and lemon juice and season with salt and pepper. Prepare the chickpeas whilst the soup is cooking and keep in an air tide container until ready to serve. Drain the chickpeas and dry with a paper towel. Spread out in one layer onto a baking tray. 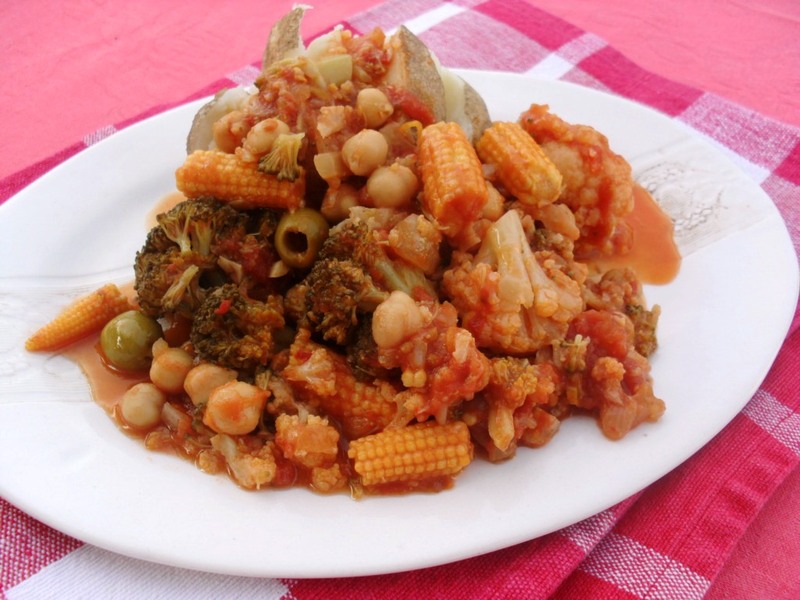 Place the chickpeas in a small container with a lid and drizzle with the olive oil. Move around to make sure all the peas are covered with oil. Add the spices and shake in the container to cover all the peas with the spices. Transfer back to the baking tin and bake for 20 minutes. Hi there. I just found your website beuacse I am a nanny and the mom is letting me cook vegan for her kids (I’m vegan, they’re not). Upon looking for advice from the livejournal vegan community, I was sent your way. I think that what you do is amazing and I have sent your site to other moms that I think would love to have a look at it. Keep up the great work. You are inspiring!